Learn about the similarities and differences between Diamonds and Moissanite. Moissanite is one of the rarest minerals found in nature also known as silicon carbide. First discovered by the Nobel Prize winning chemist Dr. Henri Moissan at the site of a massive meteorite strike in Arizona. At first, he mistakenly identified the crystals as diamonds, but in 1904 he identified the crystals as silicon carbide. The stone was named Moissanite in Dr. Henri Moissan honor. Moissanite, in its natural form, remains very rare and is only found in meteorites. In the late '90s, scientists recreated moissanite in a lab to be used in jewelry. Due to its hardness, its optical properties, and lower price, moissanite is considered a good diamond alternative. Moissanite crystals are more durable than Saphire, Ruby or Emerald and rank second after Diamonds on the hardness scale. See the below table for comparisons across with popular main stone choices in comparison with Moissanite. Natural moissanite is Rare. Moissanite sold today in jewelry is lab grown or lab created. Since the moissanite crystal is grown in a lab and not mined it is considered an eco-friendly option. Natural Diamond are created in nature deep within the earth's crust. These diamond are later mined for production to be set in jewelry and engagement rings. Recent advances in technology have made it possible to grow diamonds in the lab. They are referred to as Lab Grown Diamonds. Brilliance also referred to as white flashes and Fire color flashes. Moissanite Typically has more fire(color flashes) that a diamond. So moissanite ranks higher on the Brilliance Refraction Index 2.65. The sparkle of a moissanite gem is very distinguishable from a diamond for the above reason. Diamonds are considered white gems and have a very unique light dispersion that highlights its fire, sparkle, and brilliance which has made them a highly sought after stone in the luxury market. It is this unique quality of diamond to bend, disperse and refract light is what makes them so attractive. Moissanite comes in at 9.5 on the Mohs scale, It falls just below a diamonds which is very impressive. Mohs scale is used to rate the hardness of gems and minerals. This makes moissanite an excellent alternative to diamonds and an ideal gemstone for daily wear in an engagement ring or other jewelry. Diamond ranks 10 on the Mohs scale. The hardest known natural gem in nature. Only a diamond can scratch a diamond. This makes diamonds an ideal gemstone for daily wear in an engagement ring or other jewelry. Moissanite is generally graded for color as Near Colorless(G-H-I) to Colorless(D-E-F) based of GIA's Diamond Color Grading Scale. Even though labeled colorless, grayish, green or light yellow hues are seen in certain light conditions. Color is easier to see in larger vs smaller stones. The color of the moissanite is one of the key factors on how moissanite is priced in the marketplace. Colorless graded moissanite demands a premium over near colorless moissanite. The Diamond color grade is determined by the absence of color within a diamond. A diamond color grading scale developed by the GIA which ranges from D-to-Z is used to specify diamond color. Starting with D representing colorless and Z representing light yellow. A diamonds market price goes down with the presence of color, fancy colored diamonds are an exception to this rule. However, color is only one of the many factors that impact diamond price value. All Moissanite available in the market today is lab grown. The cost to produce moissanite is much more affordable when compared to a mined or lab-grown diamonds. This makes moissanite very affordable. Moissanite is priced on the combination of its size and color. Size is also often indicated as DEW as a proxy for Diamond equivalent weight in carats. 1ct Near colorless Moissanite retails between $300-$350. 1ct Colorless Moissanite retails between $350-$450. Gem quality diamonds occurring in nature are considered rare for natural mined diamonds and demand premium price. Historically diamond has increased in value over time, this makes diamonds a good hold of value. With the recent advances in technology, gem-quality diamonds can now be grown in a lab in an eco-friendly manner and are another option available to the modern consumer. Lab grown diamonds process it still expensive demanding a higher price vs Moissanite but cheaper than natural diamonds. A Diamond is priced on the grading of 4 base Properties of a diamond known as the 4C's(Cut, Color, Clarity & Carat). Diamond prices can vary across hundreds and thousands of dollars. 1ct Colorless VS1 Natural diamond retails between $5000 - $15000. 1ct Colorless VS1 Lab diamond retails between $3500 - $10000. 1ct Near Colorless VS1 Lab diamond retails between $2200 - $5500. *retail value subjected to change as per market demand. 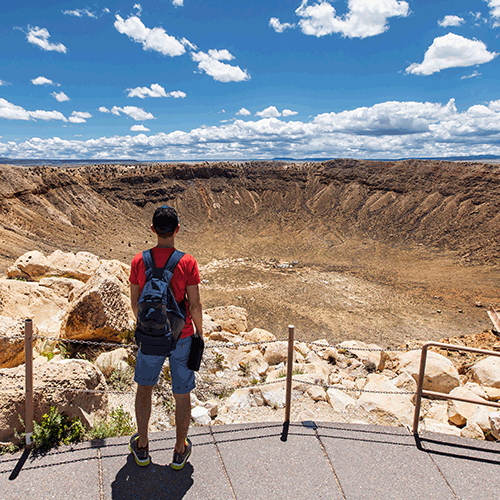 Canyon Diablo meteor impact crater in the state of Arizona which led to the discovery of Moissanite. 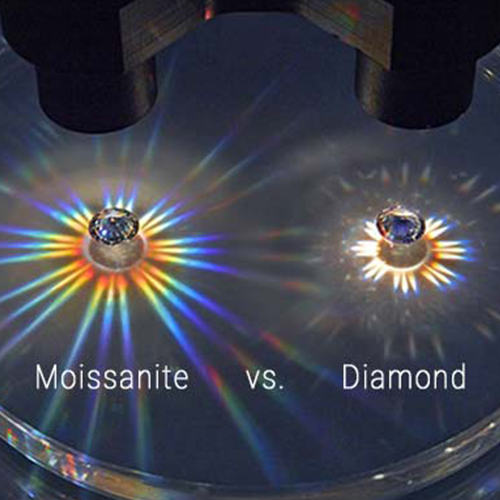 Moissanite and Diamond are shown side by side in a petri dish filled with water. A pin light is used to show the gemstones light dispersion. Created in a lab with low environmental impact and ethical responsibility. Brilliance Refraction Index of 2.65 and 9.5 Mohs hardness makes moissanite a desirable stone for jewelry and everyday wear. Moissanite is very affordable when compared to Diamond or other precious gemstones. What do I choose ? A Diamond or a Moissanite. Some consumers prefer diamond for tradition, prestige, heirloom or natural origin. Others prefer moissanite for sustainability or ethical reasons, or simply because they can get the aesthetic they desire for less. Our job at Sun Diamond is to educate you and make you aware of the different choices you have so that you can choose one that aligns well with your beliefs, best fits your budget needs as well as your personal preference. This is a personal choice with no wrong answers. If you’d prefer a diamond, buy a diamond.